I recently bought carpeting from Vincent. I was so happy with the service I received during the buying process and the installation process. Cynthia kept in contact with me often regarding the delivery and installation times. I also was able to get a Saturday appointment. The day of installation the men showed up right on time. They were super nice and finished my job in 2 hours, when they thought it would take 4 hours. They cleaned up after the job was done and when before they left my new carpet area was super clean. I highly recommend floor town for any of your flooring needs. Happy to share my experiences of working with Floor Town. 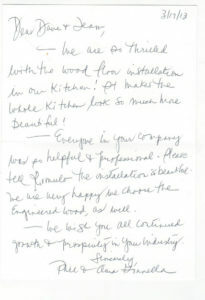 They were recommended by our builder for the gut renovation of our new place in Guttenberg. (Very glad we opted to have Floor Town do the install, rather than the Builder.) My wife & I enjoyed the shopping/selection process with Michelle at the Paramus showroom. Dario is a real pro, who takes a professional approach to the install with a knack for solving tedious details. We just completed the 2nd phase of our flooring replacement. (You can see the subtle transition between phase 1 & 2 at the doorway) I am very proud of their contribution to my own home/project. Love the new runner and the installation/service was great! Our recent experience with Floor Town was a pleasure. We had purchased flooring for several rooms a few years ago and went back when we needed a new floor for our kitchen. The service and attention to detail were impeccable. The salesman took the time to explain all our flooring options and made suggestions to help us keep on budget. The installers were very professional and arrived as scheduled. The floor is perfect and we could not be happier. 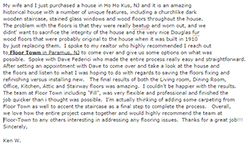 All of the people at Floor Town were knowledgeable and focused on doing a quality job. 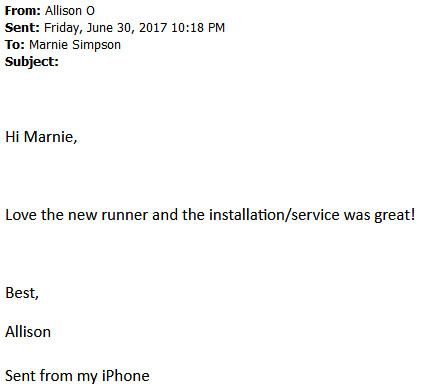 They maintained contact with us both before and after installation to make sure all aspects of the process met our expectations. Floor Town is a company that never disappoints. Floor town put my linoleum floor down. What a great job they did. It’s the best job of all the contractors. It cleans up easy too. Thanks. In November we had an unfortunate renovation project with our kitchen that required the ultimate removal of the vinyl flooring, sub floor and lower kitchen cabinets. 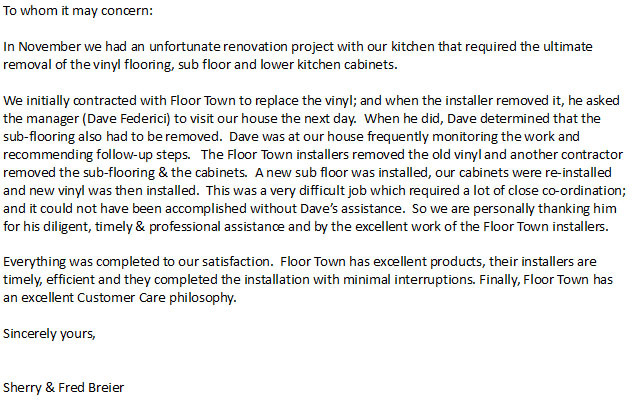 We initially contracted with Floor Town to replace the vinyl; and when the installer removed it, he asked the manager (Dave Federici) to visit our house the next day. When he did, Dave determined that the sub-flooring also had to be removed. Dave was at our house frequently monitoring the work and recommending follow-up steps. The Floor Town installers removed the old vinyl and another contractor removed the sub-flooring & the cabinets. A new sub floor was installed, our cabinets were re-installed and new vinyl was then installed. This was a very difficult job which required a lot of close co-ordination; and it could not have been accomplished without Dave’s assistance. 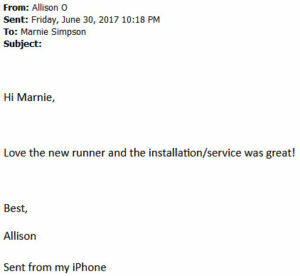 So we are personally thanking him for his diligent, timely & professional assistance and by the excellent work of the Floor Town installers. Everything was completed to our satisfaction. Floor Town has excellent products, their installers are timely, efficient and they completed the installation with minimal interruptions. Finally, Floor Town has an excellent Customer Care philosophy. In September we decided to remove our old carpets and have new carpets installed for our upstairs bedrooms, hallway and stairway. Since Floor Town has an excellent reputation & a good selection of flooring, we went there to determine what was available. We found a product we liked and contracted with them to install the carpets. The Floor Town installers arrived as scheduled and did an excellent job in removing our old carpets and installing the new wall to wall carpets with minimal disruption. There were a lot of angles, corners and difficult moldings which required timely detailed cutting; and everything was completed, as scheduled, to our satisfaction. We love the new carpets; and thank Floor Town for a good product and for an excellent job. Your guys just left after coming earlier than expected and doing a very nice job. I don’t know if you remember, but they didn’t have to split the room and the landing; it all flows as one. They managed to do the closet as well and left me a sample. Start to finish a very pleasant and professional experience thanks to you and your team. I just wanted to send a note and let you know that the guys finished up my apartment yesterday (2 days-yay!) and it looks absolutely incredible. The guys were so nice, so professional, so trustworthy, and so tidy. I wanted to tank you for all of your help and understanding in scheduling this installation and working with my building’s management office. I can’t wait to do some dancin’ on my new floors! You have always done a great job with anything we have needed, both here at work and in my home, it is my pleasure to use Floortown. The Most Professional and run by people who care. We recently replaced a carpeted bedroom floor with a wood laminate one. 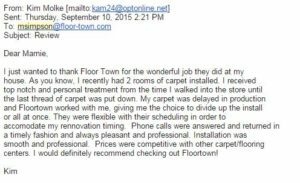 Our salesperson, Steve, at Floortown worked with us to find the best solution. He and the entire Floortown team were caring and very professional. In addition, the installation was done beautifully, far exceeding our expectations. We would highly recommend Floortown. This is our third floor installation from Floortown and we highly recommend them. In March 2015, after sustaining water damage to our kitchen floor, we chose a beautiful porcelain tile form Floortown. The entire process, including removal of 4 layers of previous flooring went very smoothly. Kenny and his installation crew are true professionals and we were very happy with the result. However, about 2 weeks later we noticed some of the grouting between the tiles was cracking. Kenny responded quickly and after returning twice they completely removed the cracked grout and resolved the problem. My husband and I had water damaged to our living and dining rooms. Our home owner insurance highly recommended Floor Town. Vinnie had tremendous patience with us. He answered all our questions and assured us all would be fine. The installation process was amazing. They worked very hard, gave attention to detail, and did a great clean up. We will be using them again and will recommend Floor Town to all. Dear Marnie, I just wanted to thank Floor Town for the wonderful job they did at my house. As you know, I recently had 2 rooms of carpet installed. I received top notch and personal treatment from the time I walked into the store until the last thread of carpet was put down. My carpet was delayed in production and Floortown worked with me, giving me the choice to divide up the install or all at once. 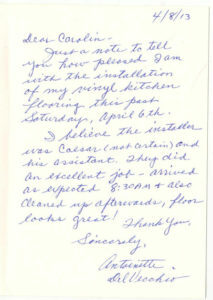 They were flexible with their scheduling in order to accomodate my rennovation timing. Phone calls were answered and returned in a timely fashion and always pleasant and professional. Installation was smooth and professional. Prices were competitive with other carpet/flooring centers. I would definitely recommend checking out Floortown! 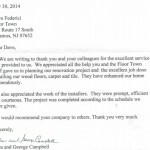 I used the services of Floor Town in Paramus to install new carpets in both of my bedrooms and new hardwood flooring in the living and dining area. I first met with Michele who was very knowledgeable and helpful in helping me select the right product for my new condo. She spent a good deal of time explaining all of the products and responded quickly to any questions when I called and left a message. My wife and I just purchased a house in Ho Ho Kus, NJ and it is an amazing historical house with a number of unique features, including a churchlike dark wooden staircase, stained glass windows and wood floors throughout the house. The problem with the floors is that they were really beatup and worn out, and we didnt’ want to sacrifice the integrity of the house and the very nice Douglas fur wood floors that were probably original to the house when it was built in 1910 by just replacing them. I spoke to my realtor who highly recommended I reach out to Floor Town in Paramus, NJ to come over and give us some options on what was possible. Spoke with Dave Federici who made the entire process really easy and straightforward. After setting an appointment with Dave to come over and take a look at the house and the floors and listen to what I was hoping to do with regards to saving the floors fixing and refinishing versus installing new. The final results of both the Living room, Dining Room, Office, Kitchen, Attic and Stairway floors was amazing. I couldn’t be happier with the results. 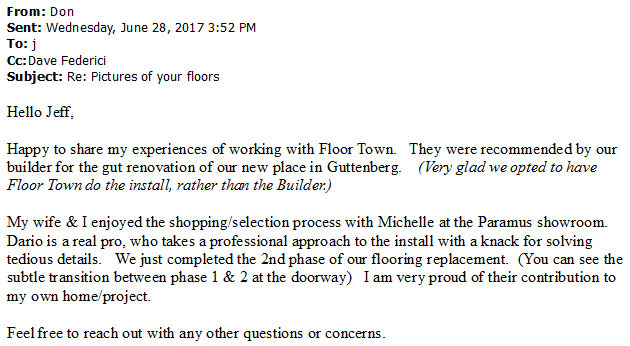 The team at Floor Town including “Fill”, was very flexible and professional and finished the job quicker than i thought was possible. I’m actually thinking of adding some carpeting from Floor Town as well to accent the staircase as a final step to complete the process. Overall, we love how the entire project came together and would highly recommend the team at Floor-Town to any others interesting in addressing any flooring issues. Thanks for a great job!!! We are writing to thank you and your colleagues for the excellent service you provided us. We appreciated all the help you and the Floor Town staff gave us in planning our renovation project and the excellent job done installing our wood floors, carpet and tile. They have enhanced our home tremendously. We also appreciated the work of the installers. They were prompt, efficient and courteous. The project was completed according to the schedule we were given. We would recommend your company to others. Thank you very much. Hi Dave – We are truly impressed with the way the floor came out! Like night and day to what it was before. I am so glad I was able to share my Dave and Floortown experience with Adam. Hadn’t been for the State Farm fire claim in our Hawthorne, NY property, I would never know about you even though I passed your store on Rt. 17 tons of times over the years. And I do appreciate you taking us to your home that evening on the spur of the moment to show us Fil’s work. 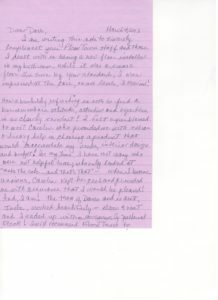 He was very professional, patient and accommodating – just like you! Best regards. I was meaning to send the email to say that the floors looks great! Moises corrected the squeak well so I was very happy about it. Thank you very much for your follow up. We had a great experience with you guys and so appreciate the great install. I would be happy to be a reference. We are very pleased with all the work. Your staff was very professional and did a great job. We also appreciate your advice and recommendations. Angelica was a big help too. Thanks again, Happy New Year, and I look forward to seeing you soon. Our kitchen floor looks beautiful. We have received many compliments and kitchen not even finished. So, thanks very much for all the coordination and courtesy you have given me. Just a note to tell you how pleased I am with the installation of my vinyl kitchen flooring this past Saturday, April 6th. I believe the installer was Caesar (not certain) and his assistant. They did an excellent job – arrived as expected 8:30 AM and also cleaned up afterwards, floor looks great! Thank you. Dear Dane + Jean, We are so thrilled with the wood floor installation in our kitchen! It makes the whole kitchen floor so much more beautiful! Everyone in your company was so helpful and professional. Please tell Romulo the installation is beautiful. We are very happy we choose the engineered wood, as well. We wish you all continued growth & prosperity in your industry. Last year we bought carpeting for the upstairs of our home. We worked with Carolyn then and she was a pleasure. So much so, that we came back this year and worked with her again to purchase carpeting for the first floor of our home. In both cases, the quality of the carpeting seems to be wonderful and exactly what we were looking for in each of those spaces. In both cases, Carolyn was fantastic to work with. And in yesterday’s case especially, Carolyn was great, Kenny was terrific measuring and making sure that the pattern we chose used had as little extra as possible (it was one of your more expensive options), and the guys who actually delivered and installed? Yes, they took much more time than any of us had expected, that’s true. But in looking at the final product and in knowing how our over 100 year old house has no straight edges, using a pattern, tight spaces for part of the installation… they did a fantastic job. Thought you would want to know – your entire team does really great work. When we get around to the basement flooring – won’t be for a little while – we will definitely come to you first. Thank you for a great job!! Many thanks for you outstanding service. Dear Owner & Manager,On Friday, March 2, 2012, we, Larry and Elizabeth, had a piece of vinyl installed in our basement.We would like you to know of the great help Peter has been to us by helping, advising and guiding us as to the best way to accomplish the job we wanted done. He also helped select a piece of vinyl that would get the job done. We do appreciate his taking care of us. We spoke at different times while at the store with Angelica, Vinnie, Kim, Dave and Keith. They were all helpful and answered our questions with patience and gave us time. There was another woman, I didn’t get her name- She would go on the above list of helpers. The installers, Caesar and his helper, did a good job. They were professional, knowledgeable, and courteous. Our experience with Floor Town has been a good one. We would recommend Floor Town. Dear Dave, I am writing this note to sincerely compliment your Floor Town staff and those I dealt with in having a new floor installed in my bathroom. While it was a small floor I’m sure by your standards, I was impressed at the care on all levels I received!How absolutely refreshing in 2012 to find a business whose attitude, attention, and expertise is so clearly excellent! I felt super blessed to meet Carolin who provided me with extraordinary help in choosing a product that would accomodate my needs, interior design, and budget! In my time, I have met many who were not helpful to me; who only looked at “make the sale.. and that’s that”- When I became anxious, Carolin kept her cool and provided me with assurance that I would be pleased! And, I am! The team of Dave and his assistant, Joele, worked beautifully- clean & neat and I ended up with a gorgeously patterned floor! I will recommend Floor Town! Thanks for coming out on a Saturday, Peter–it is invisible now–perfect solution! 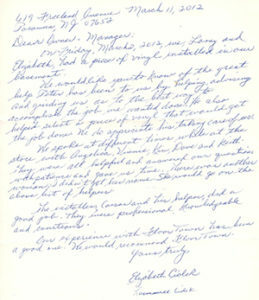 I will be contacting you soon regarding another project that I mentioned for wood floors. Great team, great selection, great expertise and great service all at a good price turned our sq. ft project consisting of installing new wooden floors, staining existing wooden floors and laying new carpets on floors and stairs into a great experience and final result. Even when unavoidable surprises turned up and I was considering to cut corners it was Floortown that took ownership and solved it 100% – no questions asked. I’m very happy with the end result thanks to Dave and his team. Dave, the two gentlemen did an excellent job with our kitchen floor last week. Wow! It’s really great. My husband says they were very polite and very professional, knew exactly what they were doing, and it shows. They cleaned up. too.Also I think your materials are first-class. That piece of linoleum looks like expensive tiles. No one would know unless they bent down and felt the floor. We are scheduled for the carpet installation on Thursday, July 23. Would it be possible for the installers to come over at 1:00 p.m. that day? I will definitely unwind my ivy plants from the stair rails before that, and will also take everything off the free-standing shelving unit by the stairs so it can be moved out of the way. Thanks! Dear Keith,Elaine and I would like to express our sincere appreciation to you for all your personal and professional assistance in replacing our floor. All of the Floor Town staff and your technicians were extremely courteous and thorough during the entire replacement process.Enclosed please find and check in the amount of $500.00 which represents our insurance deductible for floor replacement at 175 Rochelle Ave. Unit 115, Rochelle Park, NJ. Again, thank you. Just wanted to let you, and your co-workers, know how much my husband and I are enjoying our new floor which you installed in July. We feel that we should let you know how much we appreciated the attentiveness to detail, design and of course installation that Floor Town provided. From first choices to finished product there was never any problem that could not be solved.Also, the level of service we experienced from everyone was exceptional – especially appreciated since the concept of customer service seems to be a vanishing idea. Obviously, we would recommend you to others. Please share email with the rest of the staff. Thanks again. Hi! 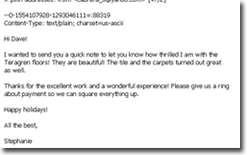 I Just wanted to thank you for all your help in getting our carpet situation resolved! They did a great job installing and it looks good. I’d recommend you for sure! We are builders in Orange County and possibly Consider you for Future Projects. Thanks Again. Hi Dave! I wanted to send you a quick note to let you know how thrilled I am with the Teragren floors! They are beautiful! The tile and the carpets turned out great as well. Thanks for the excellent work and a wonderful experience! Please give us a ring about payment so we can square everything up. Happy holidays! We have used Floortown for years now from our first home in Dumont to our present home and this is why -It has always had a vast variety of products and stock to choose from. It is a pleasure to deal with the associates of this wonderful store. They are informed, professional, and a pleasure to deal with. They work with you or give you space to browse and decide, no pressure but very helpful when needed. There are many parts involved in the process of picking, purchasing, and having the floor put in. It flows effortlessly with each separate person involved regarding handling their area in ordering, checking out the home/floor area, and the installers. Any problems, concerns, or questions, were handled professionally and promptly. Dario, the installer, was terrific. (Over the years, they all have done a great job!) The preparation, install, and clean up was wonderful. A craftsmans at work. He took his time and worked in a quality way. He asked questions about things he was not sure of in regard to how we wanted some finishing details. 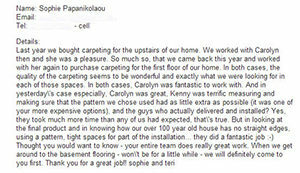 Seeing that the customer was happy and satisfied with the floor was very important and a priority. We will be ready for our bathroom floor next and will absolutely be using Floortown again! I have to give two thumbs up to the staff at Floor town for incredible customer service, and most of all I needed to come back in person to personally tell the owner (David) of his installer Ronaldo who did an outstanding job installing my new floor. His workmanship was behind what you would expect.I highly recommend for a stress free job and awesome results.You won’t be sorry. Carolin really took time to explain the differentiation in the wood floor products and helped with the color and style.She also recommended the trim. The finished look is amazing! Thanks to Virginia and Dave as well! Awesome customer service!!! Dave and his team have been a pleasure to deal with. The floor guys had great knowledge and made my floors look beautiful. I will recommend Floor-Town to everyone!! Thank you Dave and Team!! Dave and his team provide superior service! 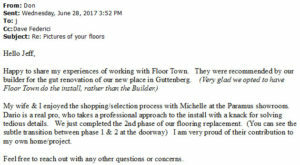 I have been a FloorTown customer for decades and highly recommend them to all my family and friends. My recent renovation included engineered wood flooring in the dining room and living room, as well as kitchen tile. 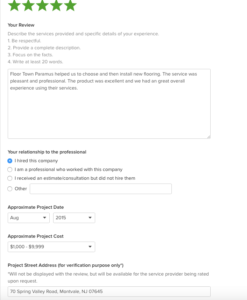 Angelica was a helpful salesperson for the tile, and then Dave provided a home consultation to help with the decision for the hardwood flooring. Kenny and Dario were great as well. Plus, Virginia was so friendly and helpful with all the scheduling. The entire team really knows their field and is very knowledgeable; their vast experience is evident in all their dealings. Dave went the extra mile in helping with the final details that made the job outstanding! 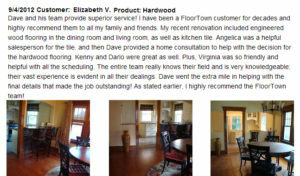 As stated earlier, I highly recommend the FloorTown team! Floor Town was outstanding. Primp, reliable, hard working and always available for questions. Floor is beautiful! Hi Kenny, Certainly was worth the wait — the floor is beautiful. The guys did an outstanding job. Cynthia has already sent me the paper work I needed. Thank you again – always nice to work with true professionals! Have a great day. The staff was very welcoming and was able to answer all my question. They saw my project through from start to finish. Great job I would return for my next purchase. Vinny was wonderful and very knowledgeable and showed us what we need for our floors. The installers were very professional. I would highly recommend Floor Town to all my friends. 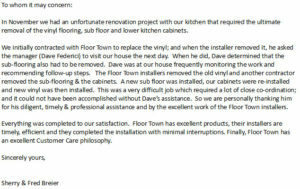 We couldn’t have had a better experience with Floortown for our kitchen floor installation. From working with the salesperson to Kenny the project manager to the great installer Pedro… We will definitely do repeat business for many years to come. Wide selection, good prices, excellent installation work. Second time they did a job for me, in a few months it’ll be the third time. Hi Dave & Cynthia, The floor looks great, we are happy with the results. Carlos and his crew did a great job and cleaned up everything before they left. We wanted to be sure that Floor Town was aware that we are very happy with our floor and the professionalism from start to finish. Dave’s visit (2X) to our home to see and measure the kitchen. Provide suggestions of blending the floor from one room to the next. And our options for patching/filling the hardwood floor in the dining room where the wall came down. Visit to your store for selection of flooring. installation went smoothly. Work was started and ended on schedule. Love the way the kitchen floor blends with the three entrances to the room. Well done. If I had to be disappointed about something, it would be that the tile does not go all the way back to the wall behind the stove. When the stove was pulled out for the backsplash the tile was in the way of the stove’s back legs. Overall, our experience with Floor Town was positive. We would gladly recommend your business to anyone who is looking for flooring.